This gorgeous two-piece prom dress is a stunning combination of sparkling jewels and shimmering satin. The sheer-illusion crop top has swirls of multi-color beading from the high neckline to the midriff-exposing short hem. A gleaming satin a-line skirt flares out for a flattering silhouette on this fabulous formal dress. 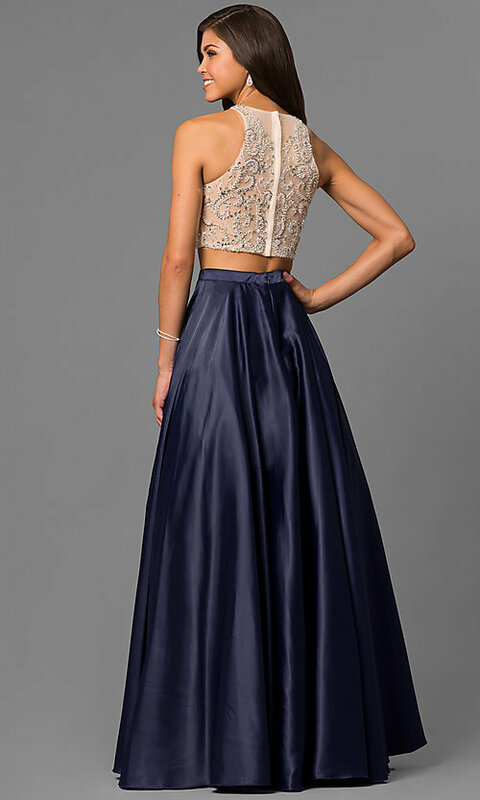 Under $250 for prom or winter formals, this two-piece prom dress is sure to impress the crowd as it illuminates your exciting event. Top 15", Bottom 49", Hollow to Hem 63"